My mom used to make a Chocolate Chess Pie when I was a kid and it was so easy. It had 4-5 ingredients and I absolutely loved it. As you can see from a Random Recipe post earlier this year, I have continued to try to recreate her recipe – with not the best of luck. Nothing seems to taste like I remember. I think Chris is bored with my trying, however, since I am not one to quit — I am not giving up. This is my most recent attempt of trying another Chocolate Chess Pie recipe. The crust ingredients listed below made too much and we had to throw a bunch of it away. 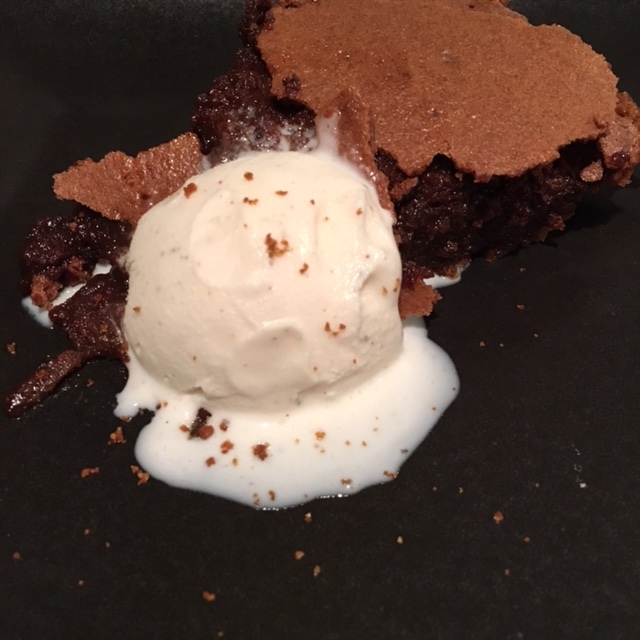 To me, a Chocolate Chess Pie should always be served warm with vanilla ice cream. Make the crust: Preheat oven to 350°F. Grind the graham crackers in a food processor until they are a fine crumb. Place in a bowl and stir in sugar and melted butter with a fork. Press into the bottom and up the sides of a 9″ or 10″ pie dish. Bake until firm, about 10 minutes. Make the filling: Melt the butter with chocolate in a medium sized bowl in the microwave, heating on high in 30 second increments and stirring until the chocolate is melted and smooth. Once the chocolate is melted, whisk in the flour, sugar, vanilla, and salt. Whisk in eggs and egg white until the mixture is smooth. Pour mixture into prepared crust. Bake until the top is puffed and filling is set in the center, 35-40 minutes. Let cool, serve at room temperature. Top with ice cream.